I go out riding and I don't ride fast some days. I ride with others and they are as slow as hell. I've figured out what the problem is most of the time (other than mortality concepts or forgetting to turn). We forget how to use the throttle. Sure, we all know that when we spin it we go and when we shut it we slow. The issue here is, how quick are we on it and how hard are we on it. To ride quickly, the rider really needs to be on the gas as soon as possible during turn exit and needs to be on as much gas as possible without breaking the rear wheel free (or to just slight wheel spin). An option exists to help the rider get on the gas hard, the quick throttle. A throttle tube with a large diameter drum that reduces the angular motion needed to bring the throttle body valve to full open. Throttles are described by their rate. Twist (degrees) divided by travel (mm). This allows you to compare one throttle to another while off the bike. Once on the bike (and each bike is different), a throttle is usually refered to fractionally (ie, 1/4 or 1/5). This is arived at by dividing the degrees to full throttle by 360 degrees. Simple. 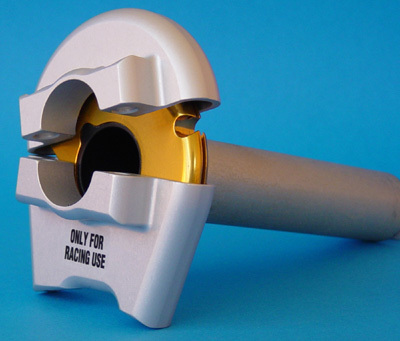 Faster rate throttles are usually available through the bikes race kit parts group. For Honda these are the HRC Parts, and for Yamaha these are the YEC Parts. Big Valley Honda , Kyle USA, or Rising Sun Cycles is a great resource for these parts. About the nicest fast throttle you can get is the Euro-Racing Fast Throttle. It is sold also as the Yoyodyne Quick Turn Adjustable Throttle (E80061). It features a selection of 3 different rates and is constructed of teflon lined aluminum. Be prepared to spend around $169 for it, well over twice the cost of most kit throttles. 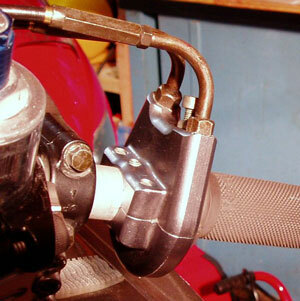 One of the best and easiest ways to obtain a different type of throttle is from another bike. RC51/VTR1000 bikes have separate starter/kill switches and throttle assemblies. The RC51 throtte has a drum diameter of 33.66mm for a 3.33 deg/mm rate. On my F4i that translates to a 1/4.5 fractional. The starter kill switch needs to be rewired in the connector block and the stock throttle cables need rerouting, plus 2 small locator holes in the bar, but the results are nice. Also, dirtbikes have high rate throttles. The key is to find one that has a push/pull configuration. Custom cables may have to be made to swap these parts. 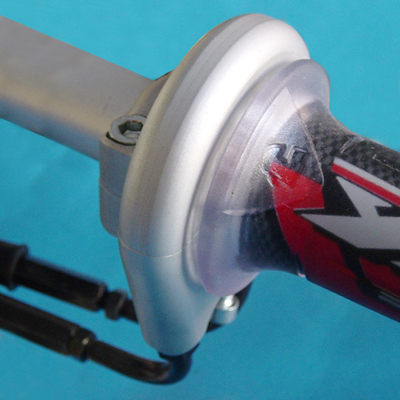 Aftermarket throttles are available through Red Racing Parts , Motion Pro, Lockhart Phillips, Magura. If you ride a supersport type bike, chances are that a quicker throttle is part of the manufactures "race kit". The throttle on my Honda CBR600 F4i has a 90 degree (1/4) spin and a 31.75mm (1.250") diameter drum pulling approximately 24mm (0.982")of cable. The rate of this throttle would then be 3.61 deg/mm. I have used the RC51 throttle, and it is better than stock. It reduces the rotation by 7 degrees. It's pretty nice. I've got an HRC F4i Throttle now, it comes with one of the cables to replace. It is a 75 degree (1/5 fractional) throttle, about a 38mm (1.500") drum. This throttle is crazy. I am now using so much of the engine that I never knew I had. Super good mod..